One of the biggest concerns after a home fire is getting rid of the odor of a fire. Unfortunately, this is also among the most difficult activities. Records which survived the 1906 San Francisco fire and are today in the National Archives still smell strongly of smoke — over 90 years latter. Besides the use of chemicals to mask the smell, there are two general approaches used commercially. One is called Thermal Deodorization and the other is Ozone Treatment. Ozone is a viable choice with pianos, but frying them is NOT. Heat treating a piano will cause the frame to over dry and come apart. Remember, too, that the source of the odor can be very complex. For example, with furniture, the smell may be literally on the surface in the soot; or it may in impregnated into the finish, especially if the finish was softened by the fire. A softened finish should be replaced completely. Ozone provides effective purification of air and water from bacteria's, viruses and other microorganisms, and ozone eliminates odors without producing any hazardous byproducts. Its natures own purifying process. It is the odor cancelling quality of ozone that we are dealing with. Ozone also kills mildew. For this reason, pianos which have been affected by smoke can be deodorized by ozone treatment, and pianos which took on mildew by being stored or used in damp areas can have the mildew virtually killed off completely. Please read our page on ozone, mildew, and moth treatment carefully. specially formulated to counteract fire and related smoke odors. added to any cleaning solution and will not alter the action of the cleaner. have to restore or polish the finish. of 9-D-9, 1-2 ounce of Last Resort per gallon of lukewarm tap water. and fiber cleaning solutions as needed. See label for additional instructions. single most effective solution to deal with skunk odor. Last Resort. Keep what is left handy for odor issues that seem to be beyond help. the odor producing effects of smoke damage. body odors, skunk odors, severe pet and smoke odors, etc. Last Resort to one gallon of lukewarm tap water. 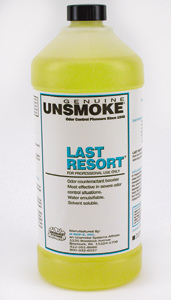 Last Resort® per gallon of water. Application: Contact spray onto odor sources. See label for additional instructions. harvested in Africa from the pyrethrum daisy (Chrysanthemum cineraiifolium). surfaces like bedding, mattresses, upholstered furniture, drapes and carpet. dismissed when you wage war on pests. household rooms, & mild odor removing ozone shock treatments of small areas. make some air purifiers dangerous and offensive. The XT-120 and the XT-240 are perfect for dorm room air purification. purifier has this type of useful timer built right in! Perfect for a bedroom or office. above their lowest settings to clean the air in room sizes mentioned. like the inside of a piano, to remove strong odors. doors off of units cost 2 & 3 times the price. They have to be tried to be believed. do cause breathing and other problems. 15 feet by 15 feet or larger in a matter of minutes. The AZXT-240 can purify the air in rooms up to 30 feet by 30 feet. Old style ozone "plates" may create large amounts of Nitrogen Oxides which are offensive, irritating, and dangerous. 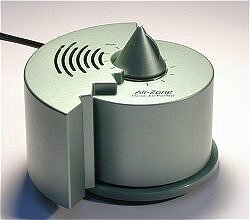 Air-Zone's patented ozone elements are in a permanently molded housing, that require NO adjustment whatsoever. They also don't produce dangerous Nitrogen Oxides. Air-Zone® uses 24 carat gold plating in our United States Patented ozone elements to help prevent corrosion. We also use high temperature, shatter resistant, tempered glass in our innovative ozone elements. Old style ozone "plates" consist of flimsy, easily corroded, steel screens and delicate, thin pieces of glass or mica, less than a millimeter thick. They must ALWAYS be kept perfect alignment or there is a chance that screens will touch and the transformer will short out and become a fire hazard. We do not use MICA ozone plates in our ozone generators. MICA is the cheapest and worst material to use in an ozone plate. MICA easily breaks, flakes apart, burns, and shorts out the generator. Stay far away from any ozone generator using a MICA ozone plate. If not cleaned and aligned constantly, old style ozone "plates" will produce less ozone, and possibly even spark out dangerous high voltage electricity. Air-Zone's® patented ozone elements solve all these problems. Old style ozone "plates", first designed in the 1800's, must be removed, scrubbed clean, dried, and be meticulously reassembled, or they will not work correctly. Even with all that work, their life span is notoriously short. 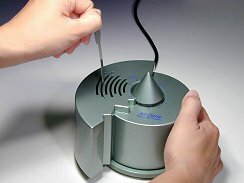 Air-Zone's® low cost, patented ozone elements can be quickly cleaned with the special included element cleaning tool we include with every ozone generator. They can be replaced in minutes with a screwdriver. Old style mica ozone "plates" consist of 4 separate parts. Each of the 40 pieces in a competitors 10,000 mg/hr ozone generator must be meticulously installed and aligned for the ozone machine to work properly. Our corona discharge elements are many more times powerful than UV Ultraviolet bulbs. Read our page on ozone treatment carefully please. This site is not our site. Use your browser Back button to return to this page. Nobody likes to admit that mice have invaded their home. A mouse takes up residence, collects food from the pantry and dogs food dish, and may even be well on the way to raise a happy little family of more mice before you see the tell tale evidence of the mouse. Mice LOVE upright pianos. They especially like to make house under the keys. There are three sections under there, living room, pantry, and restroom. Many times I have opened up an upright piano that had something restricting the keys from dropping all the way, only to find a mouse apartment in full progress. Our MouseMaster traps will catch the mouse when it first enters the piano down in the bottom area. It smells of natural real peanut butter, but the trap has a thick layer of extremely sticky substance that catches the mouse and holds it securely once it steps inside the box. 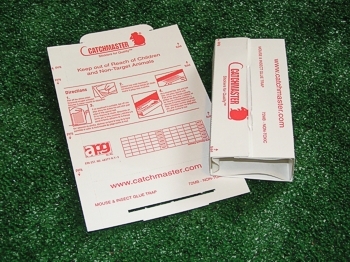 Just fold the box up by the instructions, remove the protective layer, and put the trap in the bottom of the piano. You will need to remove the bottom "kick board" by lifting or turning the lever that secures it at the top in order to open the bottom area.